In 1961 a new motel opened in Toronto. It was built by a young man with no experience in the hospitality business. The chosen location was on a street that once that had been the site of homes for politicians and the captains of industry. By the 60’s the residents were more likely to be ladies of negotiable affection or those who sought solace in the bottom of a glass or at the end of a needle. Like any entrepreneur he dreamed of success, but he didn’t have a grand plan or a vision of how it might all turn out. What he did have was a fundamental and enduring understanding of what customers would value. He knew the importance of forging close relationships with guests, employees and managers. And he recognized the need for a strong foundation that would support and reinforce his business model. These became the four pillars of the organization’s business model and his overriding philosophy. These pillars are quality, service, culture and brand. Foundational metaphors are used frequently in business. I’ve used them liberally in support of my own ideas about customers when I developed the Four Principles of Customer Experience. But this man was a builder by trade and this wasn’t just a slick marketing slogan, but a key element and deeply entrenched and enduring belief in his transition to a hotelier. His name is Isadore Sharp and he is the CEO of Four Seasons Hotels. His first property in Toronto, The Four Seasons Motel Hotel, was the start of a hospitality journey that led to the creation of a leading luxury hotel brand, with over 90 properties in 39 countries. The word brand, which features prominently in Isadore Sharp’s business philosophy, really does mean something when used by the Four Seasons. One of his earliest business decisions was to manage, rather than own, those hotels; and to make service the brand’s distinguishing edge. This meant that they controlled the promise and the experience under the brand. However, for many other hotels, it’s just a logo to adorn their properties that they can lean on it until it bends or breaks. Many multi-national hotel companies “own” the brand but the operational delivery is the responsibility of a franchisee. This is where the problems start. The hotel company is great at developing slogans, crafting mission statements and making promises. But when guests get to the hotel their experience as delivered by the franchisee often doesn’t match the promise they expected. Another well – known hotel chain is Holiday Inn. This was the brain child of Kemmons Wilson, another young idealistic builder from Memphis. Started in 1951 in a golden era of family life and post-war aspirations and aided by the development of a cross-country road network, more frequent leisure travel became the norm. Mr Wilson recognized the need for clean, reliable, affordable accommodation for young growing families who were his target market. His motto and his promise was “no surprises.” It was a simple yet poignant symbol of value and expectation that all his employees understood and delivered daily. While the motto has checked out, the spirit and the promise remain, and Mr Wilson’s original dream and value proposition survive and prosper. While the company does have some luxury brands, such as Intercontinental, HUALUXE and Crowne Plaza, many of their properties are squarely aimed at the mid-low range market with their Holiday Inn and Holiday Inn Express brands. But this doesn’t mean that the guest does get great value. I stay there regularly and shared one such experience in an earlier blog. As many of you, I travel frequently and the quality and value of hotels are of a vital importance. I’m continually reminded of this, particularly when I have a bad experience. 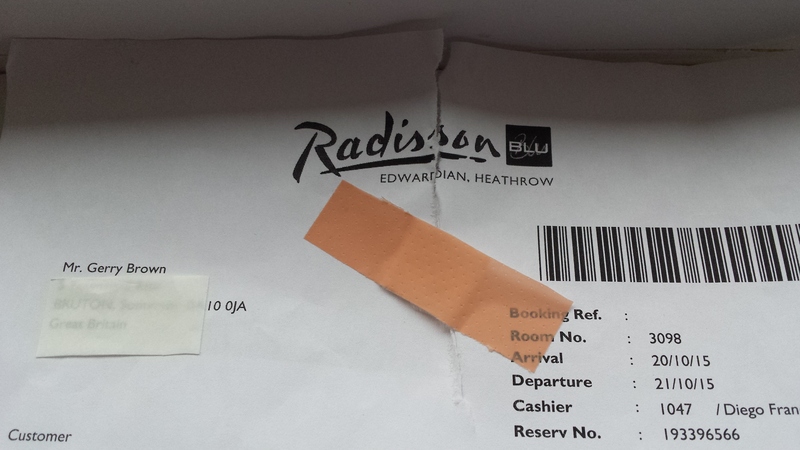 My most recent wake-up call was a truly appalling experience I had at the Radisson Blu Edwardian at London Heathrow. You can read my review on Trip Advisor for the full story. This wasn’t just about my stay. It spanned the full customer journey from initial booking to check-out. Most of the staff must have missed the memo about customer experience being everyone’s responsibility. It clearly demonstrated what can happen when brand value and service delivery is disconnected and separated from operational reality. This disconnection seems all too prevalent, and is often magnified at airport hotels, who fail to see that it’s not just a single room night that’s in jeopardy, but the life time value of a guest and their family, who can become either brand advocates or bad news bears based on a single poor experience. It is a sustained building of trust delivered by each employee that nurtures brand loyalty. The Radisson website contains the usual slick marketing bumph about their mission and how important customers are. But clearly they’re just words on a page as the employees didn’t appear to have read them and management only paid lip service to them. But even getting their lips to move or their pens to work seemed a step too far. Despite emailing the Radission Blu CEO when I first encountered a problem, and then sending follow-up letter to both him and the CEO of Carlson Hotels, neither seemed troubled enough to acknowledge my concerns or to respond. In my mind the overriding reason for this lack of consistency is the consolidation and mergers and acquisitions that have been prevalent across all businesses in recent years, especially in the hospitality sector. As I write Starwood was acquired by Marriot, thus forming the “new” world’s biggest hotel company. The various reports were littered with references to annual cost savings, being the uncontested top hotel player and increased shareholder value. It was topped off by Marriot CEO Arne Sorenson who said that he and his colleagues had “become more impressed by what we can accomplish by being bigger.” You’ll notice that the guest or the customer doesn’t figure in any of the reports or any of the statements. They seldom do. You might well call this the Fred Goodwin school of (mis)management, where bigger is always better; there’s always another deal to be made, greed trumps good business sense. This acquisitive behaviour rarely if ever benefits customers. It simply sates the avaricious, arrogant appetite, extravagant ego and unbridled corporate lust, of the CEO or MD that sees it as his (usually- but wait a minute, Carly, Meg, Irene?) career defining moment. I strongly believe that the primary focus for a hotel, beyond a warm bed, should be a duty of care. Not so much in the health or social sense, though all of those responsibilities may well apply. But when you think about it about it, the traveller, especially those on business, is quite often alone, away from their loved ones, familiar surroundings, and perhaps is apprehensive or nervous about an important business meeting. Isadore Sharp certainly recognized this and notes in his excellent biographic book Four Seasons – The story of a Business Philosophy, that “this isn’t about frills; this is about the services that you need to do business effectively, and that’s what we’re here to provide. This is the time that they need an actual or metaphorical arm around their shoulder. The former may not be listed in the hotel’s services and perhaps strays dangerously into the area of whispered extras. But the property should recognize this need, and be able to deliver on the latter, as this is really at the heart of what a brand promise means. That may differ in its depth and breadth, depending on the brand position. But there are some fundamental principles that any property should follow and that can show your guests that you really CARE. The hotel business is awash with slogans and promises. But to deliver on them, and truly influence the culture of the organization, consistency is a non-negotiable cornerstone. Isadore Sharp notes that “the one idea that our customers value is the consistent quality of our exceptional service.” This is where the hotels with disconnected teams and disengaged employees really fall down. And this isn’t just the preserve of the luxury brands. Consistency is the hall mark of my Holiday Inn experiences wherever I stay. At any one time all of the team chip in to do whatever is necessary, beyond their actual role, to ensure that we have a great guest experience. There’s no “not my job, man” here. Where doing the right thing for the guest or customers just comes naturally, and where enthusiasm, willingness, adaptability, along with determination and a high level of competence made the difference. We all laugh at Basil Fawlty and his fawning and insincere efforts to curry favour with his guests. Generally we can spot the impostors in most customer service situations. We appreciate it when people are encouraged to be themselves, to be real human beings and consequently provide a more authentic, consistent and memorable customer experience. Brands are only authentic if the customer experience matches or exceeds the promises made in their communications. While recognizing Four Seasons is a hard to beat role model for exceptional service, there is also another strong contender in the sector – Ritz Carlton Hotels. Their motto is “Ladies & Gentlemen serving Ladies & Gentlemen.” It wasn’t dreamed up by anyone on Madison Avenue, but by a 14 year old boy named Horst Schulze in Germany. Now, he did go on to become the co-founder and president of Ritz Carlton, but he also ensured that this was at the heart of how their employees were treated and, in turn, delivered on the promise. While the leadership shares what they expect, they let the team member create what they need to do for the guest. This is based on desired outcomes, not restrictive policies or procedures, which allows the employee to inject their own personality, so that it becomes an authentic, honest and repeatable experience. Bad things can happen with even the most customer focused businesses. And how people within those organizations respond is usually what stays in the mind of the customer long after the event. Very often when things go wrong, especially with train companies, airlines, mobile phone providers and banks, you usually get the lame “we apologize for any inconvenience caused” which has a much feeling as a frozen moose on a Canadian prairie in winter. The customer facing people are usually left to face the music from dissatisfied customers and often have to explain frequent service failures or dumb policies and procedures emanating from faceless senior executives. The reality is that they would truly like to fix the problem. Most of us naturally want to help others and come pre-wired with an attitude and a caring side that is ideally suited to achieving that objective. But often organizations want to actively discourage any personal feelings or emotions from creeping into their employees’ actions. When employees are trusted to make the right decision – for the customer – even if they can’t solve the problem immediately, the employee will own it and see it through to resolution. This is all about giving employees permission to engage with customers on an emotional and personal level. It puts the responsibility for great customer experience back where it belongs; in the hands or voice of the people who deliver the service. Let them have the knowledge needed, the trust and freedom to use it wisely, and set them free to execute. Engaged and trusted employees naturally want to help and find it easy to draw on their reserves of empathy & understanding, to tune in to their customer and turn up their performance. Forward thinking organizations put the spotlight on these talents and believe that if you can unleash imagination, encourage innovation and build trust based on simple human behaviour and principles, then people will come together in a common purpose – and customers, employees and companies all win. But engagement doesn’t come easily or in quantity. A recent study from Gallup showed that the number of engaged employee worldwide continue to be less than 20%. Companies such as Four Seasons, Ritz Carlton and Holiday Inn, lead the way in customer experience and business success. While there may be differences in market segments, they’ve all based their culture of excellence on a strong set of core values, or a code of behaviour that is neither an empty promise nor a hastily devised marketing slogan. This is not mandated solely from above, but is based on shared beliefs, values, and practices. These companies understand that one of the key outputs from increased employee engagement is where all of the employees have a strong voice, and are directly responsible for developing the fundamentals on which their service culture is built. His heart, and those of his staff, will always be in it.